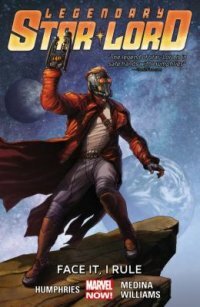 "Contains material originally published in magazine form as Legendary Star-Lord #1-5. Peter Quill battles the Badoon, fights to save an orphanage, and still finds time to flirt with the X-Men's Kitty Pryde - all in a day's work for the legendary Star-Lord! But when Peter is captured by a bounty hunter with a strange connection to his past, can the two make amends before he's fed to a giant alien? Sharing a Badoon jail cell with a criminal and a child isn't exactly Peter's idea of a good time...luckily, he's got an ace named Kitty up his sleeve. But Star-Lord soon encounters the all-powerful Titan responsible for so much mayhem in his life: Thanos! It's the battle to end all battles, but can Star-Lord possibly get out alive? Collecting Legendary Star-Lord 1-5.